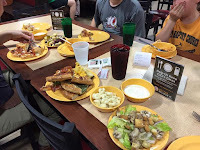 I finally went to Branson's new CiCi's Pizza. Although I've been inside a few of these restaurants over the years, this is definitely the biggest I have visited. That's for sure! I've been told it's the largest in the country. This makes sense to me, as it's owned by the same folks that brought us Great American Steak & Chicken (giant rooster), Pasghettis (world's largest fork) and a few other well-known Branson restaurants. The staff was very friendly. They had a great salad bar with 6 different dressings. In addition, they had a pasta bar which had a classic red sauce. My favorite is the Alfredo sauce. There were several types of pizza to choose from. This included a Mac and Cheese Pizza that was very popular. They also had a new stuffed crust pizza that was delicious! My friend Natalie works there. She asked if there was a certain pizza that I would like to try that wasn't on the buffet. I, of course, asked for Buffalo Chicken pizza. They made it and brought it to my table. I was so full, but couldn't turn down their famous cinnamon bites and dessert pizzas. I've had enough carbs to last a month, but for 6.99, you can't beat it! If you have kids, or are a kid at heart, there's an enormous game room. They had many classic arcade games, skee ball and some brand new games too. All in all, it's as good as any CiCi's I've ever been to and this one is the most fun by far! It's definitely a great addition to Branson. I'll be going back. 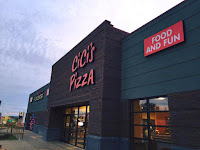 For directions and other information about CiCi's Pizza Branson, click here. Also, see our video below.